Gonzos Quest - Many British players have found Eldorado and won gold! Gonzos Quest was one of the first games ever to be released by NetEnt, and to this day is one of the most popular ones. Because of the popularity of this 3D video slot, online casinos often use Gonzo’s as a brand ambassador to attract new players. They are numerous no deposit free spins on this game which you can claim at Instacasino, Hello Casino and Betsafe to name a few. 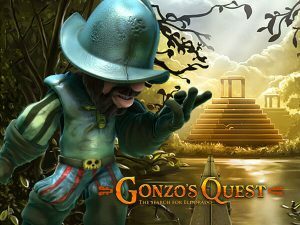 Inspired by the Spanish conquistador, your primary mission when you play Gonzos Quest is to find Eldorado the hidden city of gold. Doing could win up to 225,000 coins. The game has 20 fixed paylines, 5-reels and-3 rows. The minimum bet amount is 20p per spins, and the max bet is £50. The game features include free spins, avalanche, and multipliers. The game animation and soundtrack in Gonzos quest are simply brilliant! The game is available on a desktop, mobile and tablet. All the game symbols in this slot have been inspired by the Maja and the Aztec tribes. Each symbol pays at a different value. The Wild symbol is a grey stone with a question mark on it. The Scatter symbol is a gold sun. The symbols that pay the most is a dark blue mask, and when 5 identical symbols land on the reel you will automatically win 2,500 coins. The second best-paying symbol is a green mask and when 5 of them lands on the reel you will win 1,000 coins. A brown mask is the third best-paying symbol and is followed by a purple mask. The most basic game symbols in Gonzos Quest are animals and will award you anywhere from 50 to 100 coins instantly. What makes Gonzos Quest so appealing to players is that an avalanche and the multiplier which are trigger after any winning spin. You might also know the avalanche feature under the free fall name. This game feature consists in removing any winning symbols from the reel as other in play symbols fall to replace the missing ones, and new symbols will appear from the top. This means that every win will trigger a re-spin. A good thing about the avalanche feature is that it is unlimited and often accompanied by a multiplier which will increase with every win. In the base game, the multiplier is up to x5 and in the free spin bonus round, up to x15 which is always lucrative for players. The Eldorado bonus round consists of 15 free spins and is triggered when three gold suns land on the reel. Additional free spins round will be awarded to you if you managed to hit the same symbol combination in the free spins bonus game. There’s no limit to the number of free rounds you can trigger, which is also another reason this game is so popular. If you’ve enjoyed playing Gonzos Quest here’s a few other game titles you will certainly like because the graphic or game feature are similar to Gonzos. Jungle Jim is pretty much a copy of Gonzo’s quest, the game offers the same avalanche feature and multipliers. However, we must say that the graphics in Jungle Jim are a lot superior to the ones in Gonzo’s Quest. When you play Jungle Jim you can win up to 92,000 coins. You should consider playing this 3d video slot if you enjoy avalanche feature, free spins, and multiplier. The graphics are superb and inspired by the well-known children story. You can win up to 75,000 coins when you play Big Bad Wolf. Davinci Diamonds is a slot which also offers and avalanche feature. You might already be familiar with it as it is widely available in the land-based casino. When you play this classic game, you could win up to 25,000 coins. This is an excellent game to start your casino journey on! The wins are frequent and this game is truly entertaining. A good thing to know as well if you are planning to claim a welcome bonus is that Gonzos Quest is very rarely excluded from the wagering requirement. Some players have however noticed lag with this game when playing from a low internet connection via Chrome on a desktop. If this happen to you consider removing the ambience sounds and reducing the quality of the graphics to make the game more fluid or simply try another browser.